South Cheshire College is now complete, ready to open its doors to students starting in September 2010. 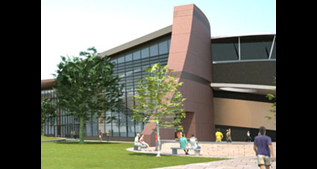 Work began in the summer of 2008, the new campus development project will lead education in Crewe and Nantwich into a new era. The project centres on the creation of a carbon-neutral building which is environmentally sustainable. SES worked closely with our client Scorpion Site Services to set out and align the complicated steel structure, as the new campus building incorporated an elaborate ten grid system layout. At first SES traversed the primary survey control and established secondary control relative to each grid system, this enabled our surveyors to execute straightforward co-ordinate transformations between each of the zones. As well as setting out the base plate positions and verticality of each column, SES provided as-built drawings of each zone for our client to hand over to the main contractor. 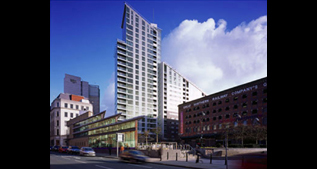 Designed by Assael architects for George Wimpey City the 25-storey residential tower providing 260 apartments rises dramatically between the historic Great Northern Warehouse and Manchester G-Mex. 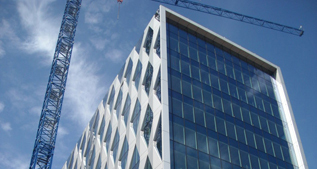 Scheldebouw were appointed the cladding package and selected SES as their Survey & Setting Out contractor. Ground floor to level 10 we provided an offset near to the slab edge which enabled their fixers to install brackets, however from level 10 to 25 the building took on a slope in the profile. SES had to adapt the setting out criteria to set out brackets directly on to the raking steelwork, all of which support panels made of glass, metal, and grey tiles. SES understands the need for a high degree of accuracy when setting out intricate cladding. The Media City UK project at Salford Quays in Greater Manchester is well on the way, this is a city designed specifically around the media industry. SES completed the Surveying & Setting Out package for the cladding on the B4 building which was supplied and installed by GIG Facades. The cladding system is a combination of stick work and unitised elements. The building has a 2 part splayed grid system from levels 00 to 05 which then steps in to form a rectangular structure between floors 05 to 13. Cladding/Curtain Walling systems today require a high degree of accuracy, by adopting stringent surveying procedures and thorough checks SES ensures the desired setting out accuracy is achieved. SES plumbed primary survey control on to each floor using plumbing holes, from this framework we then set out the gridlines and offsets for the cladding brackets. In addition to setting out, SES transferred a master datum to each floor, provided full as-built drawings of the structure and installed panels as part of a hand over and carried out fortnightly monitoring on the post tensioned slabs. It's has been a pleasure to work for our client GIG Facades on this Bovis Lend Lease project and to contribute to Manchester's growth. The exciting Gateway Plaza is a mixed use scheme strategically located in the centre of Barnsley. Our client R&S Driwall contracted SES to set out the office development and then once complete, move on to the residential block. Office: Our task was to set out the dry wall partitions and wall linings throughout the floor plates, this entailed reading the architects drawings and calculating co-ordinates for each wall type. 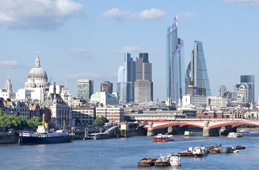 The detail involved enclosed columns, lift lobbies, stair cores and internal office space. 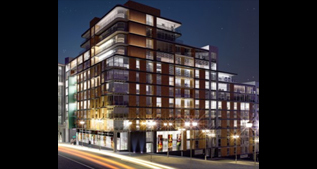 Residential: The residential block is made up of 188 luxury apartments over 15 floors. Having a vast amount of stud wall to erect, it was beneficial for R&S to have SES on site as we were able to set out the flat locations prior to the fixers starting a section. The surveying and setting out for the project came in on budget as SES offers a fixed cost solution for their clients.